Ok I have been making this parmesan and vegetable orzo recipe (sans the veg) forever. I usually serve it as a side to some slow cooked lamb shanks. It is ridiculous. So delicious. For years now it has been a side in our house, and given the luxurious nature of the dish, with the cheese, egg yolks and cream thrown in there, that has always been fine. However I had a bit of a predicament the other night, where I had a full on craving for risotto, but the kids were full on ready for dinner NOW….so I decided to load it up with some veg and call it a meal. It was great. Kind of like a fancy version of mac n cheese (but with lots of veggies added in for good measure), kinda like a cross between a vegetable risotto and a carbonara…if those two things were ever to cross. Anyway, make it without the vegetables and have it as a side to something substantial, I had it as a side to my Garlic Butter Chicken Bake, and it was fantastic. Or add a truckload of garlic sautéed veg and call it a meal. What do you think of this creamy parmesan and vegetable orzo? 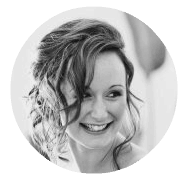 Be sure to leave a comment, like on Facebook, tweet on Twitter, or pin to Pinterest for later. Happy eating. Note: this dish is best eaten straight away. 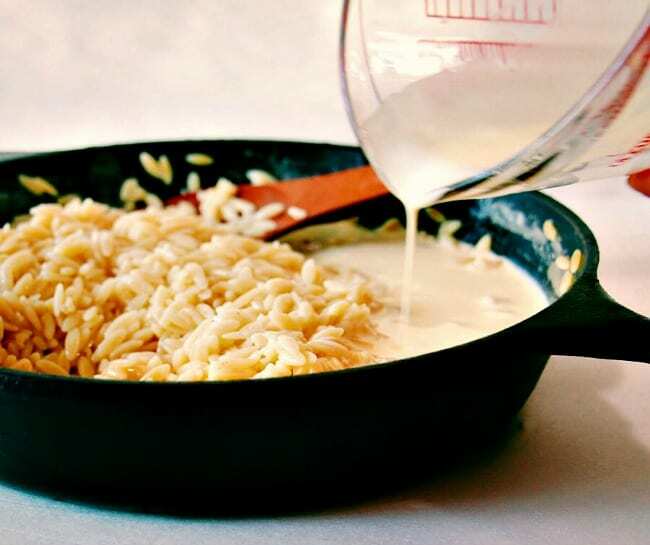 If you do happen to have some leftover, store in the fridge, and reheat on the stove top (does not microwave well), making sure to add a bit of milk, to give it back that creamy texture. The pictures look lovely. But Really, , the accolades for the look is too much. Can someone please comment on the taste or actual experience of cooking? Do any of you really cook? Wanna try it is not cute. Is this some kind of support group for an upstart? What a waste of time. 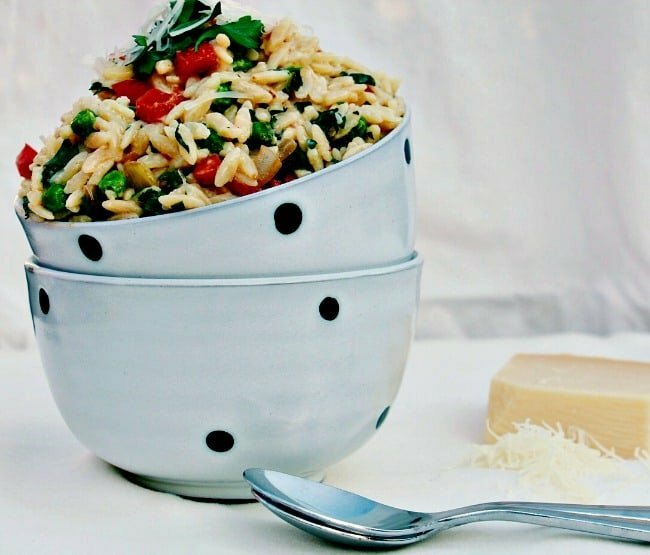 We love orzo and this sounds such a good way to use it. Thank you for sharing. I have to try out Orzo! Now I’m determined to do so. It’s almost like a carbonara with the egg in it 🙂 Sounds delicious! 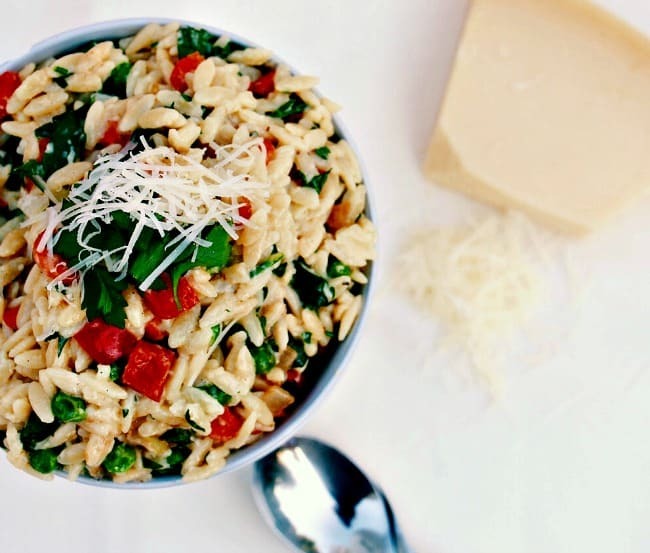 Yes, you should def try orzo, it is pretty versatile – we use it all the time. Totally like a carbonara! Ooh definitely a meal and a delicious one at that. I usually add a load of cabbage to my mushroom risotto, so I can feel virtuous when eating it and not have to prepare any veg sides to go with it. I never thought to add cabbage – I love it though, will be trying it next time! I wish that I had a bowl of this right now! It looks so creamy and satisfying! 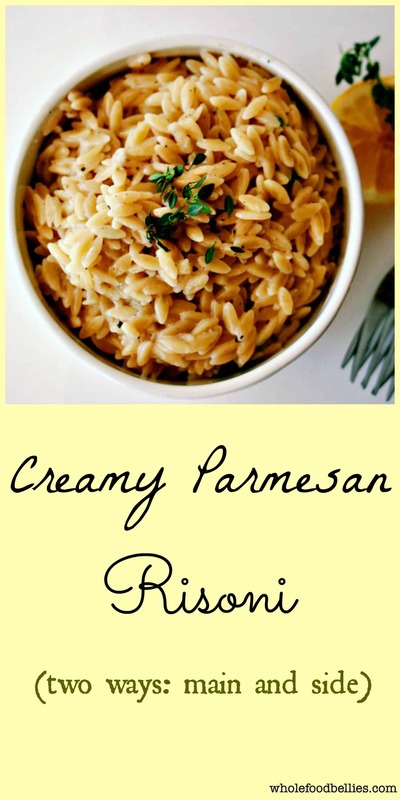 I love orzo and this looks so delicious and easy to cook. i usually make cold orzo salad but im digging this warm, cheesy version so much right now. I don’t think I have ever actually had it cold – sounds great though, I will be adding some to my next salad for sure! I could go for a bowl of this right now. It looks so delicious and creamy. 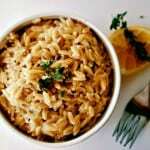 My mother used to love using orzo with chicken or steak as a main course. I love orzo. This looks like a perfect winter recipe and super kid-friendly too! This parmesan and veggie orzo sounds absolutely delicious!!! What a great side dish for the coming holidays! 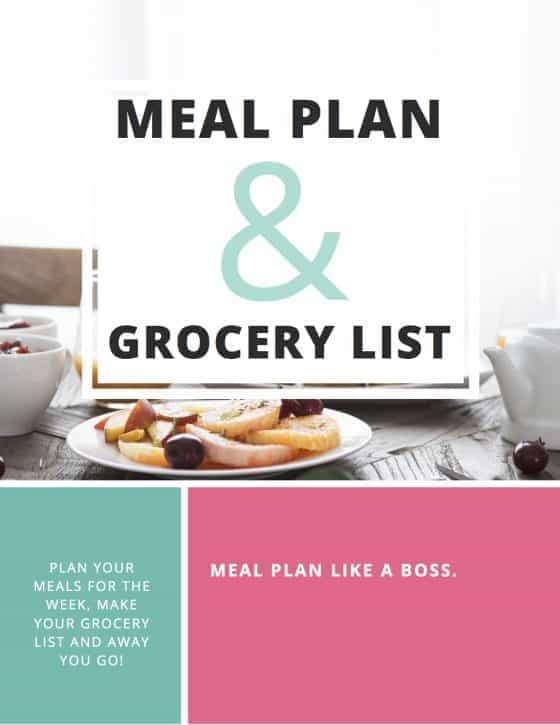 Thanks Neli 🙂 Quick and easy to prepare to boot! That looks fantastic. I really need to try cooking with orzo more often and this looks like a great place to start. mouthwatering, can’t stop to dream about it. my next gourmet dinner! Ooh, an orzo recipe! I’m happy to see this because it is my youngest daughter’s favorite pasta shape and I’m always looking for new ideas. It also has cheese, which we LOVE. I can’t wait give this recipe a try. Oh I hope you enjoy it Kathrina! 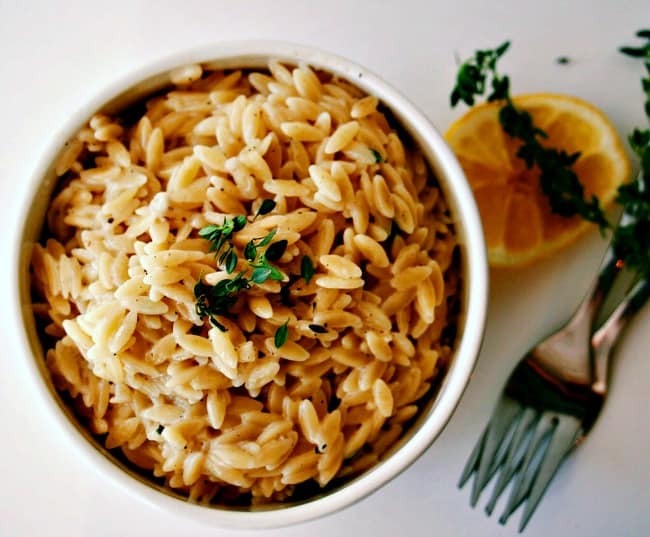 We love orzo around here (especially the kids), but it get’s a bit of a bad rap!